There are many traditional festivals celebrated by different dialect groups within the Chinese community. 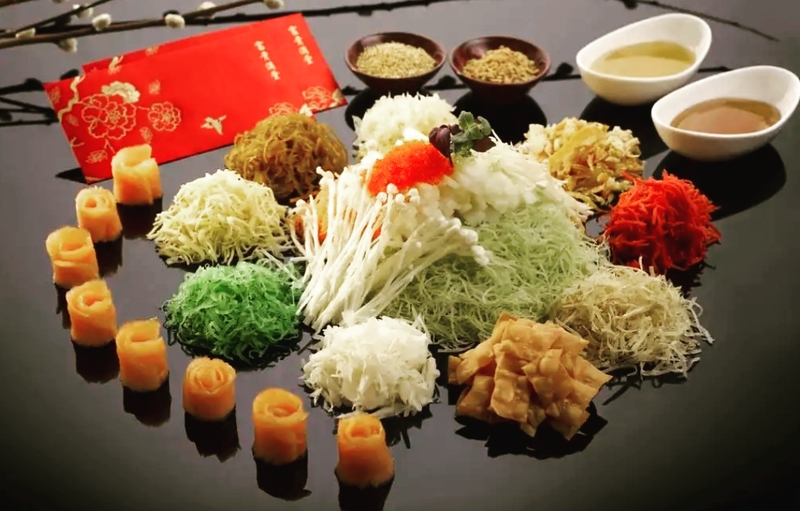 These include: The Lantern Festival, the Qingming Festival, the Dragon Boat Festival, the Moon Cake Festival, the Bak Chang or Rice Festival and the Spring Festival. The Spring Festival otherwise known as the Lunar New Year is the grandest and most popular of all these festivals. It is celebrated for 15 days. Each year is related to a Chinese zodiac animal, and this year it’s the dog. To many pet lovers this animal is man’s best friend. Thus, I am confident that in 2018, friendships and relationships will be further strengthened with new-found friends helping to forge a much wider community outreach. During the run-up to the Lunar New Year, homes celebrating the Lunar New Year will be bustling with activity – spring cleaning, getting rid of unnecessary items and making various types of cookies. There were many moments in my late wife’s (Doris) growing up years when doing things with her mother whom Doris had a special bond with, was so delightful. Moments when they were baking Chinese New Year cookies and snacks for the joyful and colorful festival. It was always a fun time for Doris cracking and beating the eggs, spooning the flour and adding sugar to help her mother make some of her mouth-watering cookies. Doris and her eldest sister were really good at making love letters, kueh bahulu, bangkit cookies and pineapple tarts. I recall during our courtship days how her late mother would smile away as Doris waited impatiently for the cookies and pineapple tarts to cool down. 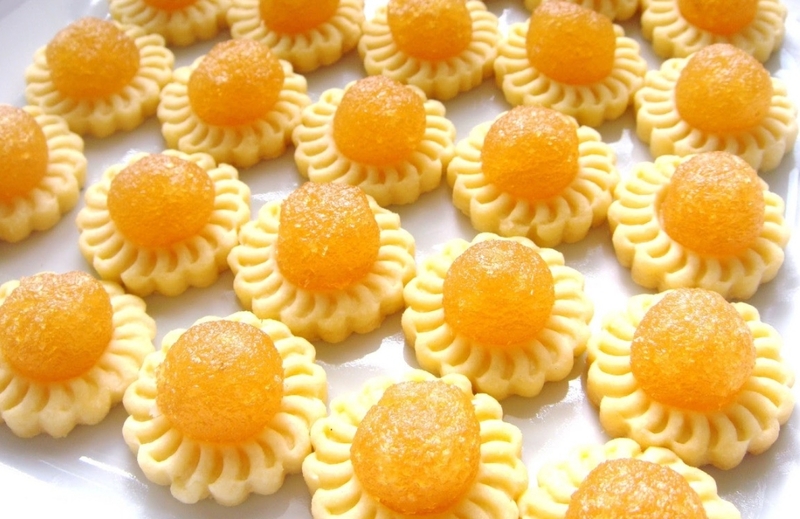 Pineapple tarts and love letters were Doris’ best -loved Chinese New Year snacks. I learnt so much about the Chinese traditions during my frequent dates with Doris. The other plus was that our different cultures forged a unique bond. According to Doris, for the Chinese, it is a tradition to thoroughly clean their homes to “sweep away” any ill fortune so as to make way for good luck. “No one must sweep the house on the first day of the Lunar New Year because by doing so, you’ll be sweeping away good luck,” her father who was born in Chinacautioned his children. Being a traditional Chinese, he followed the Chinese customs faithfully. In the spirit of family unity, Doris’ parents taught their children to love andserve one another. Everyone in the family would buy new clothes for use during this grand festival. New clothes are worn to signify the start of a brand-new year. Her mother would bring Doris to Chinatown as the atmosphere there was electrifying! Chinatown, a big tourist attraction, is always bustling with activity, but it will be ten times busier during the Lunar New Year season. The colourful lights, hanging red lanterns and all sorts of decorations would go up weeks before the Lunar New Year, with the climax of festivities going full swing on the eve of the big day. The lively atmosphere that Chinatown offers – even in those early days, will get everyone in the mood to ring in this unique festival. 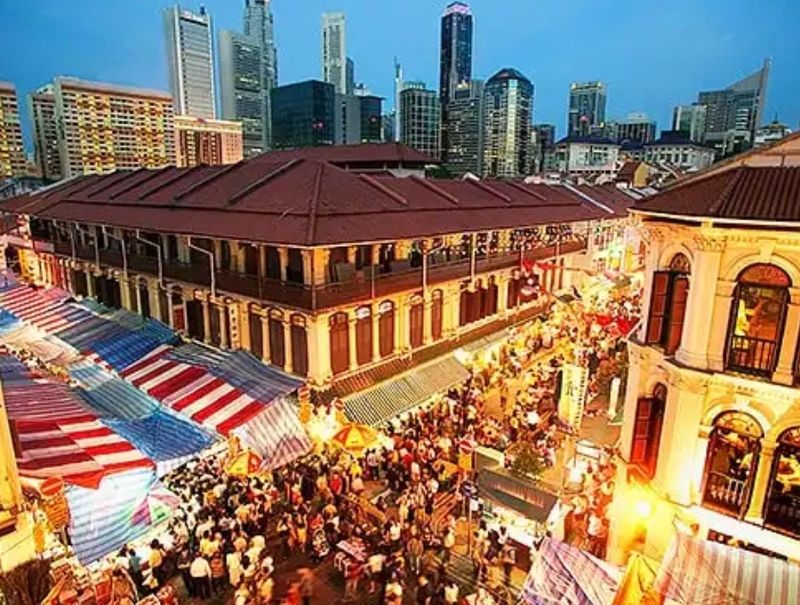 There will be lion dancers; fire eaters and female dance troupes armed with giant paper fans and intricately patterned umbrellas delighting everyone with their splendid performances. On the eve of the Lunar New Year, the whole family gathered around the dining table for the traditional, “Family Reunion Dinner.” Doris’ dad and mom would give separate Ang Pows* (*red packets filled with money) to the unmarried children in the family. The Ang Pow is supposed to bring good fortune throughout the year. 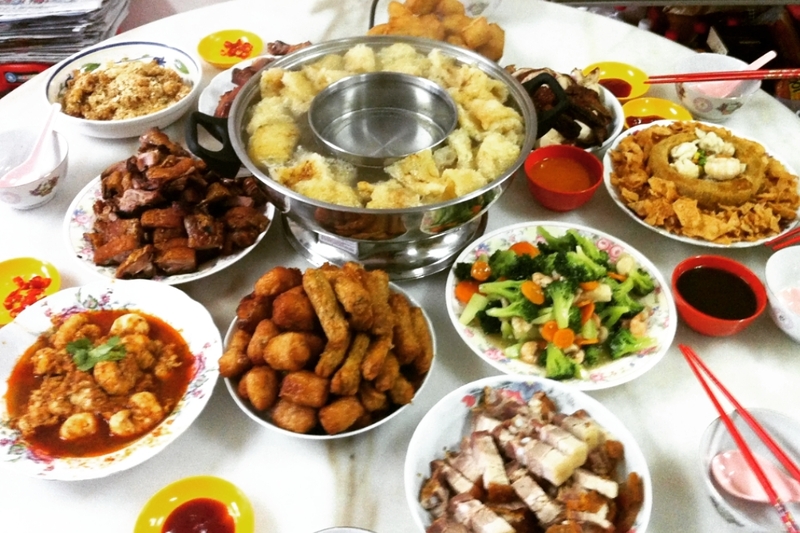 Her mother would then prepare a sumptuous spread that included chicken, prawns, fish, salted vegetable soup cooked with duck, ngo hiang and fried vegetables. Although making ngo hiang is rather tedious and time consuming due to the varieties of ingredients used, her mother loved making this Teochew specialty dish because she knew her children all craved for it. Nian gao, a sticky rice pudding cake (dark brown in colour) is also given to people to help them "advance toward higher positions and prosperity step by step." Throughout our marriage, Doris will ‘insist’ I consume a piece of this cake during the Lunar New Year, although I didn’t quite like its taste. But I still ate it –anything to please my lovely wife. After tucking in all the delicious dishes, the whole family got ready to welcomethe God of Fortune – staying late throughout the night, playing fire crackers and snacking on a variety of tidbits and cookies.